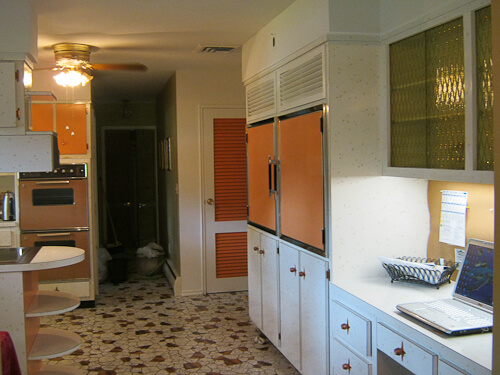 Take notice of the vintage woven window shade and the dishwasher — lovely! 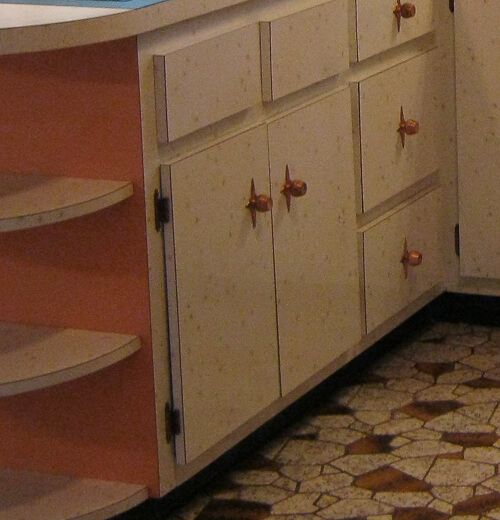 I cropped this shot to show that the orange is laminate — not paint. You gotta love the Fred Flinstone floor, too! 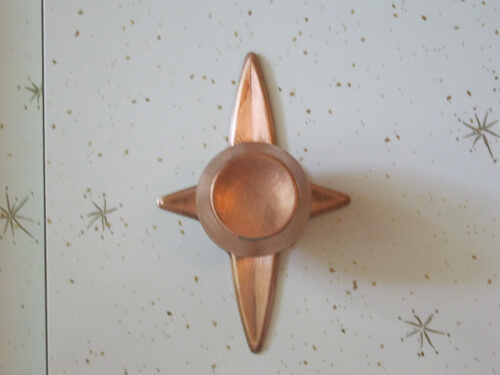 Coppertone kitchen cabinet pulls sitting on starburst escutcheons, or backplate. 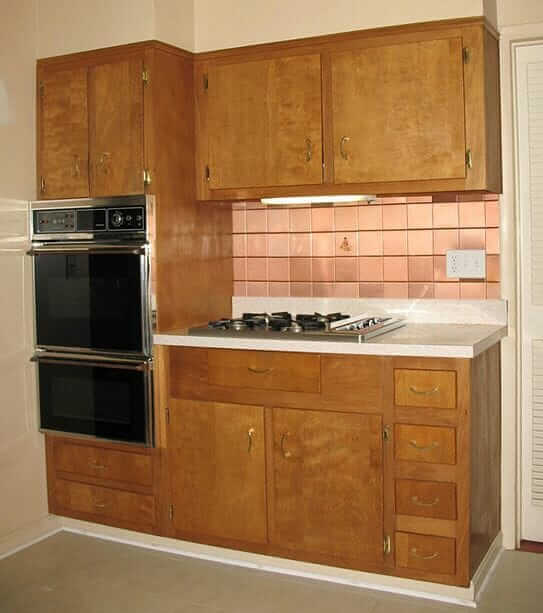 (Remember, you can replicate this style — although not exactly, and not in coppertone — with knobs and starburst backplates available from Rejuvenation. 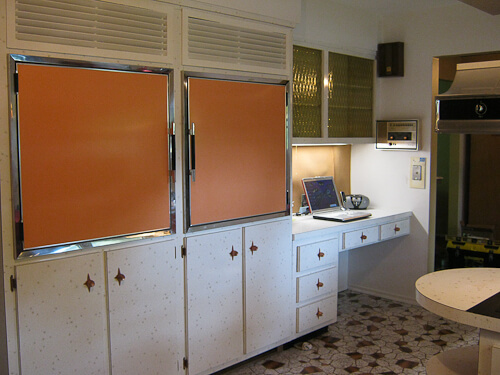 52PostnBeam, our cabinet expert over on our Forum (now defunct) where this kitchen was originally posted, says that the Revco refrigerator-freezer shown is pretty darn rare. 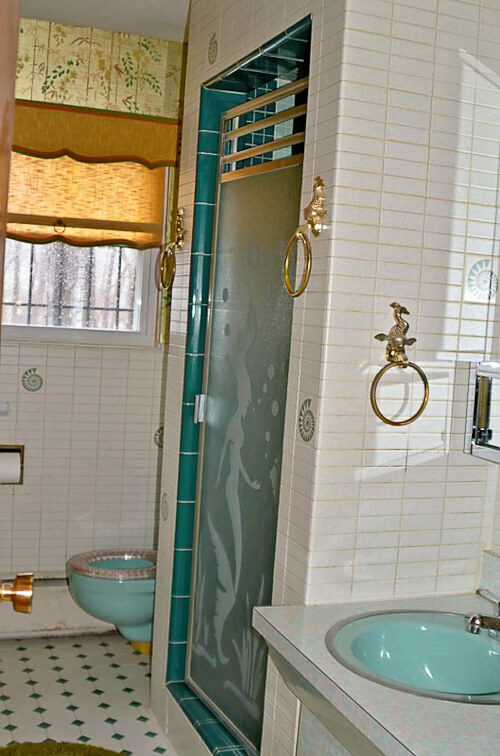 The person who is selling the kitchen also sent me photos of the bathroom. It also is getting gutted, and she is happy to sell all the bathroom hardware as well. Hall Mack fish towel rings! A mermaid shower door (note: Be aware of the potential un-tempered glass issue — consult with a professional.) She even mentions: A toilet set embedded with pennies… And do I spy with my little eye maybe a nice mirror with built-in cosmetic box? 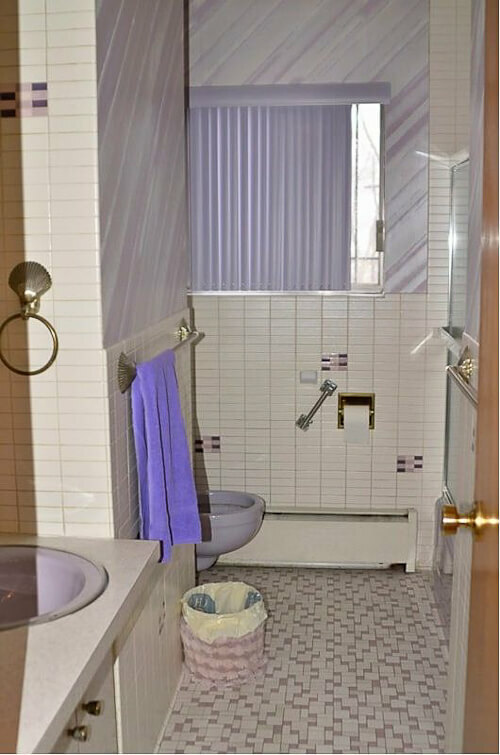 Bathroom with lilac sink, toilet and tub. Love the Hall Mack shell towel hardware. Here is the craigslist link, all this stuff is on Long Island, NY, no prices “make an offer”: 1960s laminate kitchen cabinets. I have those Revco fridge and freezer!!!!! We are trying to find someone to fix them??? Any ideas? Hey Kim- If you decide not to repair that Revco set, please message me, I’ve been looking for a set since I saw this article. This is my dream kitchen. 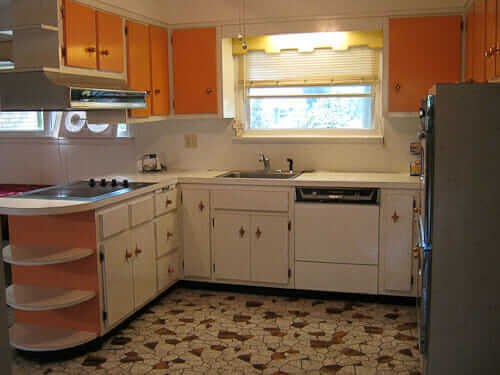 It gave me the confidence to go ahead with orange when I remodel my kitchen!